Ethernet port of the EM200 is of 100/10BaseT type. Onboard electronics of the EM200 do not include Ethernet magnetics, so magnetic circuitry must be connected externally. You can use either a standalone magnetics part (such as YCL-PH163112) or RJ45 connector with integrated magnetics (for example, YCL-PTC1111-01G). Drawings below show circuit diagrams for both parts. •The 3.3Vout is an output that provides clean power for the magnetics circuitry, which is very sensitive to noise. 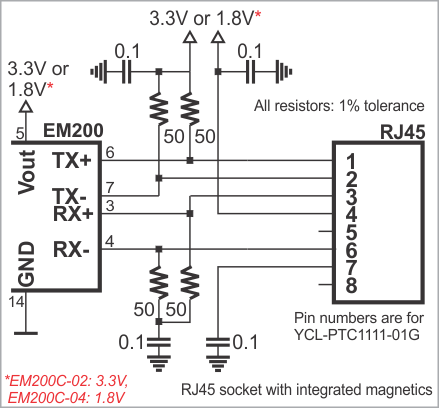 •Do not combine 3.3Vout with the VCC (main power) pin. This is counter-productive and will cause FCC/CE certification issues. 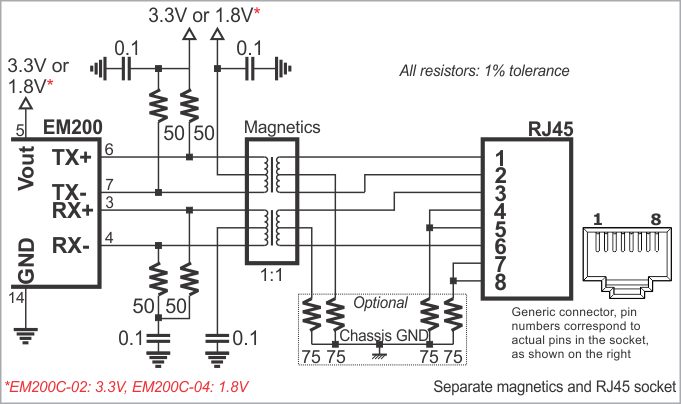 It is important to make the PCB traces connecting the Ethernet port pins of the EM200 to the magnetics circuitry as short as possible. Making the wires too long may cause the noise level generated by your PCB to surpass the maximum radiated emission limits stipulated by the FCC and CE regulations. Additionally, longer Ethernet lines on the PCB will make your board more susceptible to the ESD (electrostatic discharge) damage.